RULE 1.01 DUMPING IN THE COMMON AREA DRAINAGE DITCHES PROHIBITED. No “person” may dump, discard or deposit any garbage, refuse, rubbish, debris, building materials, waste material, sewage, toxic chemicals, motor oil, grass clippings, leaves, bushes, limbs, straw or the like in, or immediately adjacent to, the water drainage ditches that run through the Oak Highlands Common Areas. 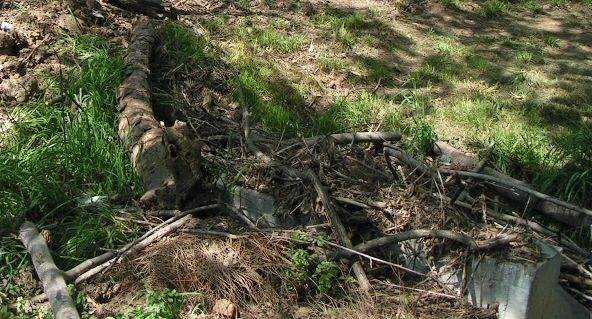 Lot owners who wish to develop, restore, alter or fortify drainage ditches on, or immediately adjacent to, their own Lot, must first submit a plan and receive express, written permission from the Board of Directors of the Oak Highlands Homeowners Association before beginning any such project to avoid violating this Rule. “Person” includes, without limitation, any Lot owner, any member of the Lot owner’s family, or anyone acting on their behalf. Violation of this Rule shall subject the person and the Lot owner involved to a penalty not to exceed Fifty Dollars ($50.00) payable to the Oak Highlands Homeowners Association and/or suspension of the Lot owner’s recreational facilities rights for a period not greater than sixty (60) days. In addition, the person and Lot owner shall be responsible for all actual damages caused by the dumping, including all costs of clean-up and removal of the material dumped. As adopted by the Board of Directors of the Oak Highlands Homeowners Association, Inc. pursuant to the Restrictive Covenants Article III, Section 6, and the By-Laws Article VII, Section 1, by resolution on April 4, 2000.